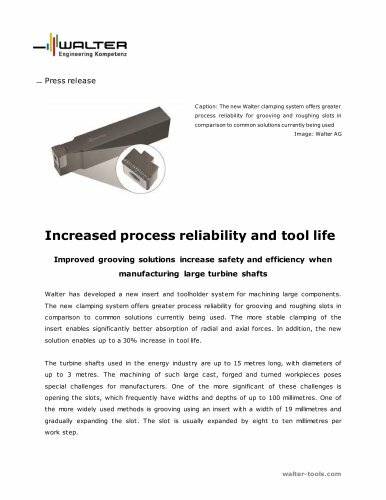 Press release C aption: The new Walter clamping system offers greater process reliability for grooving and roughing slots in comparison to common solutions currently being used Image: Walter AG Increased process reliability and tool life Improved grooving solutions increase safety and efficiency when manufacturing large turbine shafts Walter has developed a new insert and toolholder system for machining large components. The new clamping system offers greater process reliability for grooving and roughing slots in comparison to common solutions currently being used. The more stable clamping of the insert enables significantly better absorption of radial and axial forces. In addition, the new solution enables up to a 30% increase in tool life. The turbine shafts used in the energy industry are up to 15 metres long, with diameters of up to 3 metres. The machining of such large cast, forged and turned workpieces poses special challenges for manufacturers. One of the more significant of these challenges is opening the slots, which frequently have widths and depths of up to 100 millimetres. One of the more widely used methods is grooving using an insert with a width of 19 millimetres and gradually expanding the slot. The slot is usually expanded by eight to ten millimetres per work step.